Actually, I had this post written (mostly) last week, only prior to posting we were hit with disaster. Determined a "500-year" flood event, the severe weather devastated the state, and left much of our local area surrounding communities in ruins. Not exactly the time to post something so frivolous as a long-winded statement of how I like pie. What isn't frivolous, though, is the outpouring of neighborliness and community support that literally glowed through the storm when the sun was absent. We were personally so fortunate, staying warm, safe and dry at home even while there were evacuation orders, water concerns, and closures flanking us on all sides within a few miles and fewer. It was tough sitting at home, feeling chained to the Boppy pillow, and wanting to do something to help, even as we were continuously struck by how mammoth a challenge the flood could have presented with a newborn. We've had so much to be grateful for lately, it's just unbelievable. I hope we're not wearing out our karma...and that it's not too long before we have the capacity to start reciprocating again.Thanks to loving and generous family and friends, for the entire first two weeks as new parents, I didn't cook a thing, and it was marvelous. As much as I love cooking, having meals made for us was absolute heaven. The adjustment to new parenthood is hard!! Beautifully, undeniably, mysteriously amazing, but a really sharp learning curve nonetheless. In the first two weeks I prepared a few things... I chopped watermelon, fried an egg or two, made oatmeal...but I didn't cook, and the fact that I'm even bother to differentiate shows just how far removed I've been from clear-headed, schedule driven, organized life. I've always thought of time as the greatest treasure on earth, and never more so than now. My so-called "schedule" is entirely in the vise-like grip of my little monkey. Once embarking on the third week, I had this (irrational) need to cook some things just to prove I could; it's not like he's going away...though the lovely meal gifts do. So, on the 15th day in our new life, I forced myself to make granola, something that in my opinion just barely crossed over beyond the realm of preparation (as in, cooking=soup+, preparing= toast-). Two days later I made vegetable soup and tapioca pudding in the same day! Woohoo! Now closing in on one month, I've gradually built up to making simple, actual meals on an almost-regular basis. The cool thing is, making them healthy has been easy. That's after getting past the tough part, finding time to make them at all. The fact that the time has somehow been created calls for some sort of mini celebration that allows me to get off the Boppy pillow for 30 minutes...and I want to make this scrumptious fruit pie my Mom made me while she was here. It doesn't matter how old a person gets, it just feels good when Mom takes care of you. Not only did the taste and texture of tapioca work in this easy, toss-whatever-in-and-bake pie, for awhile I've been mulling over how to replace rather than eliminate corn starch from recipes. Tapioca pearls, starch, or flour fit the bill more times than I would have hoped for. It's not that tapioca itself is worth a whole lot of applause as a health food. In fact, not long ago studies presented health risks of bubble tea and its large, choke-ready sized tapioca pearls. But organic tapioca seems an attractive alternative as a thickener to typically GMO laden corn starch. It's not a nutritional powerhouse, and used in small amounts has little bearing on the overall profile of a recipe, but it does contain Folates, Calcium, Iron, Magnesium, Phosphorus and Potassium. Derived from a tropical tuber known by the names cassava, manioc and yucca, it's a staple in African cooking. Granted I am almost always exhausted to the point of delirium. I even woke up one night to find myself reaching out with the goal of breastfeeding our dog, poor thing. 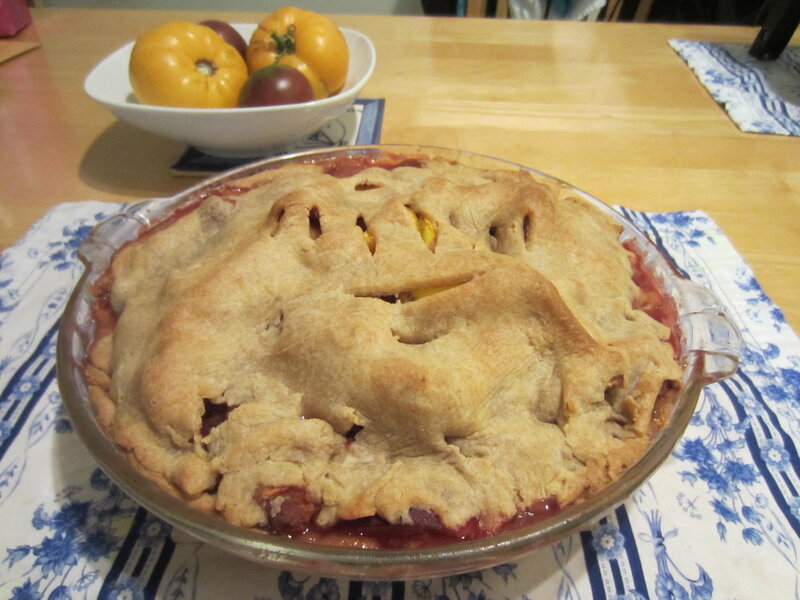 Still, I marveled at my Mom's use of tapioca in this pie. Turns out, this is actually an old-fashioned, once well known baking technique, or possibly still well-known, just not to me. Whatever, I loved the way it worked in this pie; I'm not sure how much of an impact the tapioca had, but I think the texture the tapioca brought is part of what made the complete lack of added sugar so delicious. Very ripe fruit helped, enormously, too, of course, but the combination lacked nothing. My Mom keeps recipes anecdotal and simple, and right now, that makes the best sense to me, so that's how I'm relaying it here. Basically, in her words you "make or use whatever crust you want, pour whatever fruit you want over the base, sprinkle with about two tablespoons tapioca pearls, stir, cover, and bake". In case that seems too lazy, I'm attempting a sort-of recipe write-up below. I've already been lazy enough...the pictures aren't mine, or even of the actual pie my mom made, but photos taken by my sister Susan of the pie I asked her to make because I wanted to and couldn't. It's a random shortcut, but right now I am all about shortcuts (especially the kind that lead to sleep), and it still added a little bit of happy to my day. Place peaches and berries in a colander for about 15 minutes to drain any excess fluid , then gently toss with tapioca pearls (sweetener and spices if using) . Transfer to bottom pie crust in 9-inch pie plate. Top with remaining crust. Cut vents in top crust. Bake 45 minutes in the preheated oven, until crust is golden brown. Prepare the crust: mix flour and salt together in a large bowl. Add milk and oil. Stir until mixed, and shape into two balls. Wrap in plastic and refrigerate twenty minutes or more. Roll out one dough ball between waxed paper and place in prepared 9-inch pie plate. Roll out second ball between waxed pastry. Make a lattice crust over filling, sealing edges.